WMAP Seven-year Paper Figures, J. Weiland, et al. 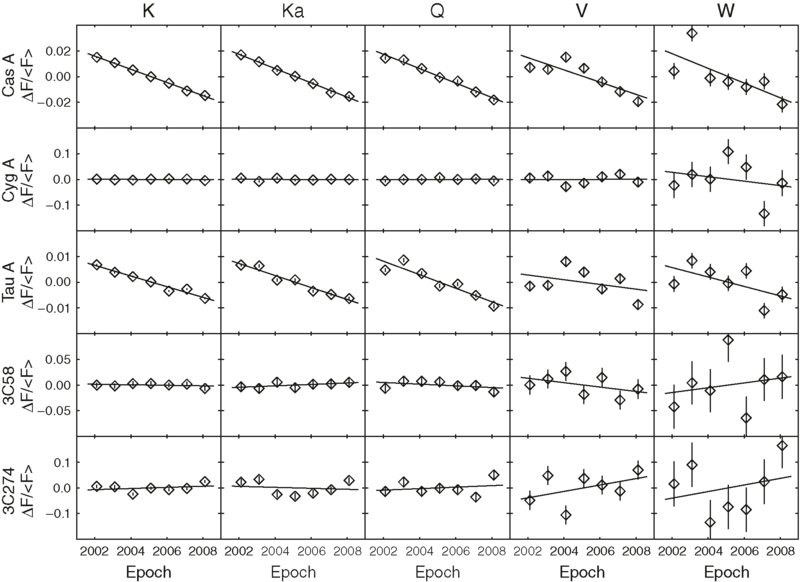 Typical single-season radial profiles of Jupiter, Saturn, Mars, Uranus and Neptune for the W1 differencing assembly. Black points are data, red line is the fit of the smooth beam profile template from which the temperatures are computed. 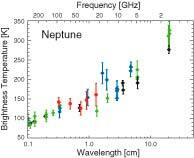 The signal-to-noise ratio is best for Jupiter and worst for Neptune. 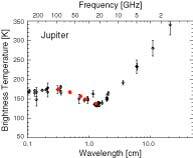 Microwave spectrum of Jupiter. Black diamonds are selected observations compiled from the literature (see text). The seven-year mean WMAP temperatures, corrected to absolute brightness and including error bars, are shown in red. Strong absorption by NH3 inversion band is centered near 1.3 cm. Minor contributions from synchrotron emission have not been removed from the WMAP data (see Section 3.2). 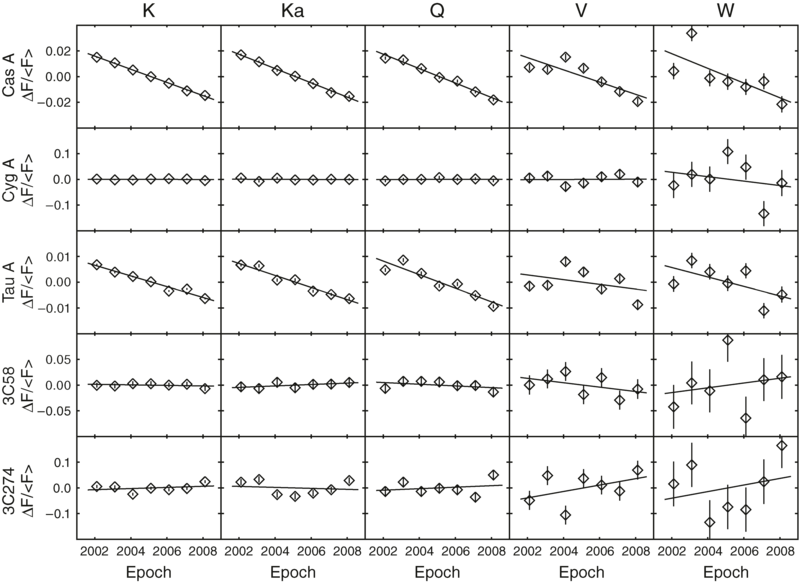 Comparison of WMAP W band seasonal averages (black diamonds, Table 6) to the Mars model of Wright (1976, 2007). 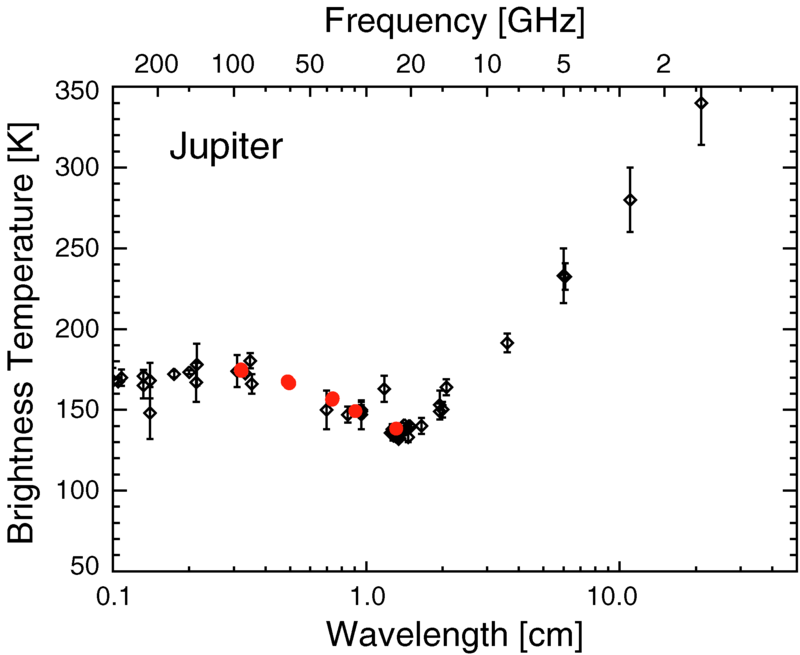 The WMAP observations have been corrected to absolute brightness. Model values (red line) have been rescaled by a factor of 0.953 to bring them into overall agreement with the observations; thick portions of the line indicate observing seasons. Data quality masking can skew the mean times of observations from the mean of the seasonal interval, as is evident in the second observing season. 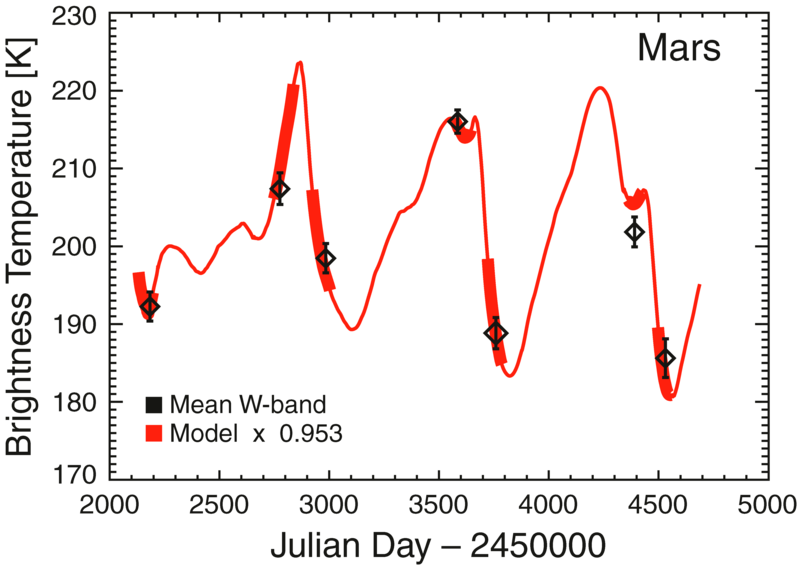 Seven-year mean Mars brightness temperatures as a function of frequency, normalized within each season to Tb at W band. Black diamonds are the WMAP data; error bars are obtained from the variation over the seven observing seasons within each frequency band. 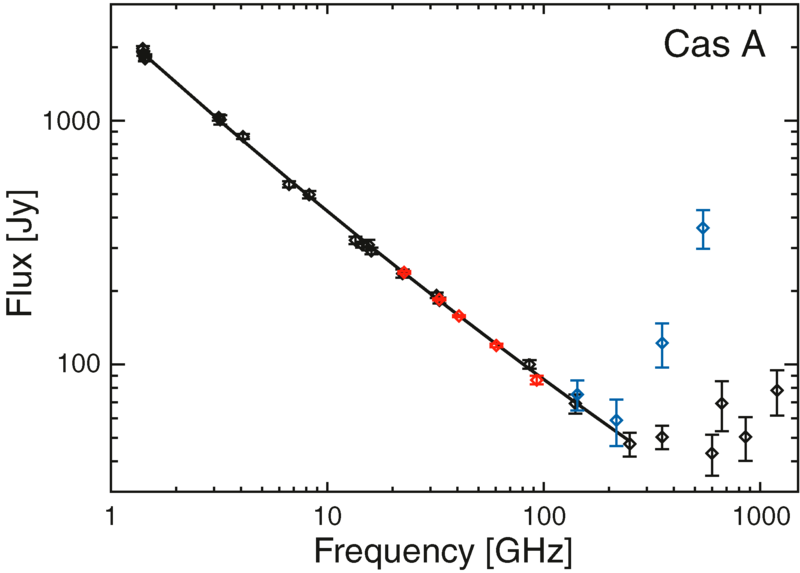 The same averaging procedure is carried out using the Wright model predictions for the mean time of observation (red line): small time-sampling and spectral variations between the frequencies cause a slightly jagged appearance. The WMAP data show a weak frequency dependence which can be approximated as (ν(GHz)/94)0.03 (blue line). This can be interpreted as a frequency dependent emissivity. Mean Mars fluxes derived from DIRBE observations in 1990 and WMAP observing season 4 in 2005. Although separated by several years, the geometrical observing configuration is similar between the two dates, and the Wright model predictions (red and cyan lines) for the two time intervals for wavelengths between 140 µm and 1.3 cm overlay each other on this scale. 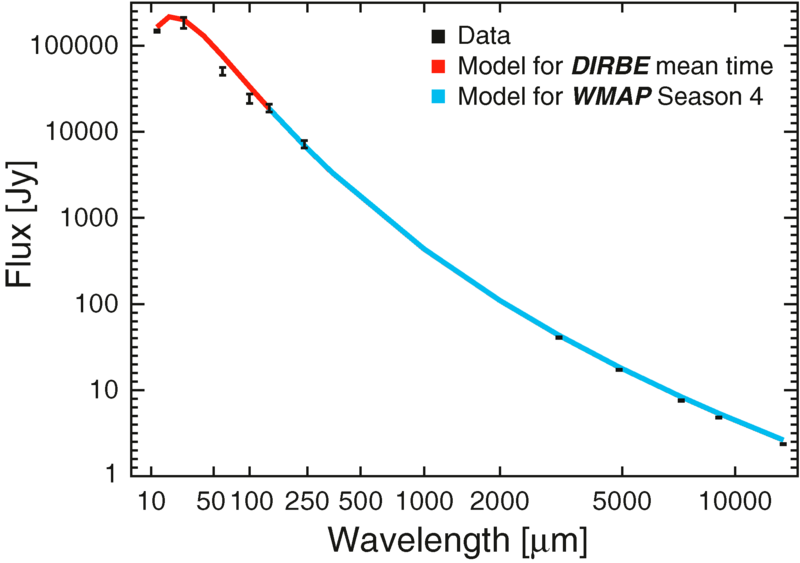 DIRBE measurements for wavelengths ≤ 100 µm do not provide good constraints for testing model accuracy. The WMAP data lie a few percent below the model, which is significant given the error bars. 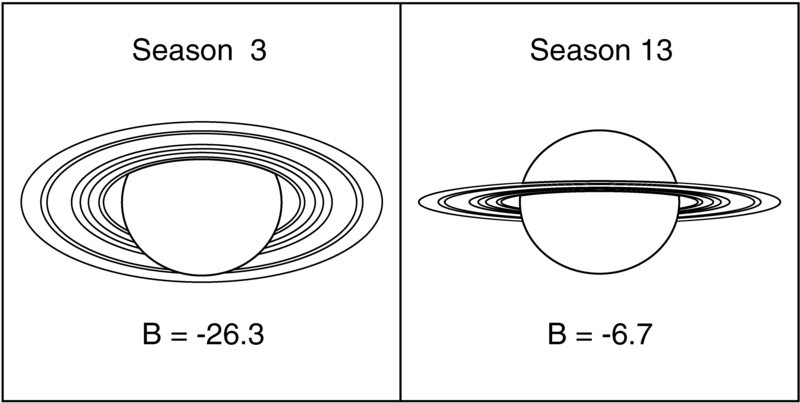 Extrema of Saturn viewing geometry sampled during the 14 observing seasons available in the seven-year WMAP data; B is the ring opening angle at mid-season. The contours illustrate the components used in an empirical model consisting of the planetary disk and seven ring regions, each of a different fixed normal optical depth. Only the A, B, C and Cassini division rings are represented, and the radial divisions follow those used by Dunn et al. (2002). Modeling results for Saturn. 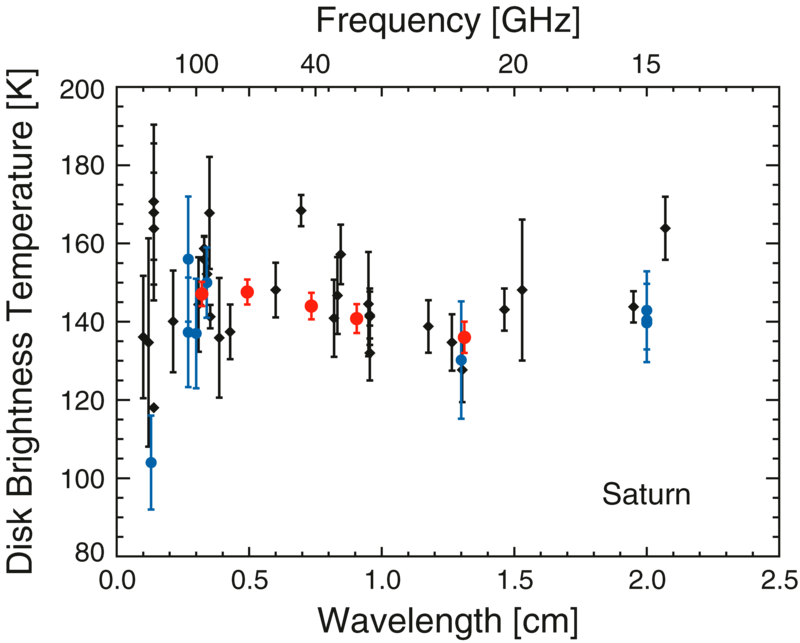 Left: Brightness temperatures based on unresolved Saturn observations as a function of ring inclination B are shown in black for each WMAP frequency band. Where there are multiple differencing assemblies per frequency, multiple points are plotted at each inclination. An empirical model including both ring and disk components (see text) is overplotted in red. The temperature of the planetary disk predicted by the model occurs at B=0°, when the rings are viewed edge-on. The model is symmetric about B=0°. Right: Residuals (data-model). The model predicts the observed brightness temperature within ≈3%. 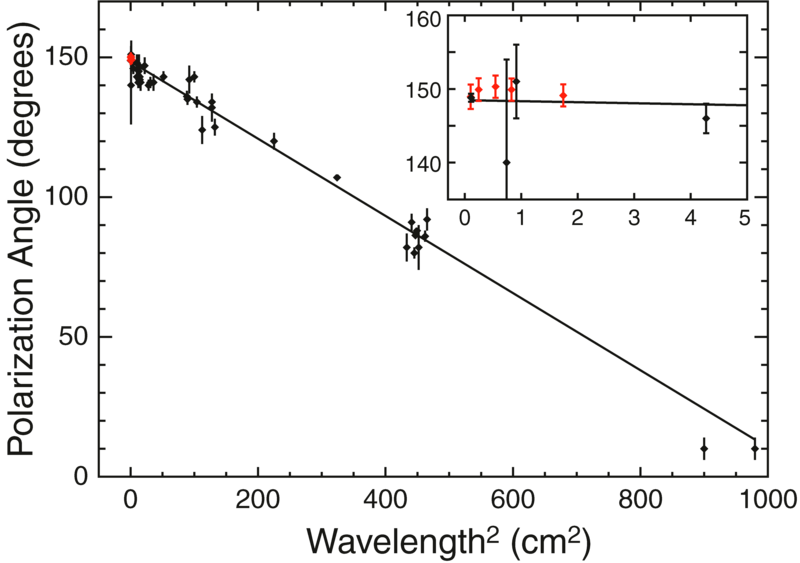 Spectrum of Saturn’s disk. Black diamonds are from Klein & Gulkis (1978), consisting of a compendium of unresolved observations which were corrected for a ring contribution. 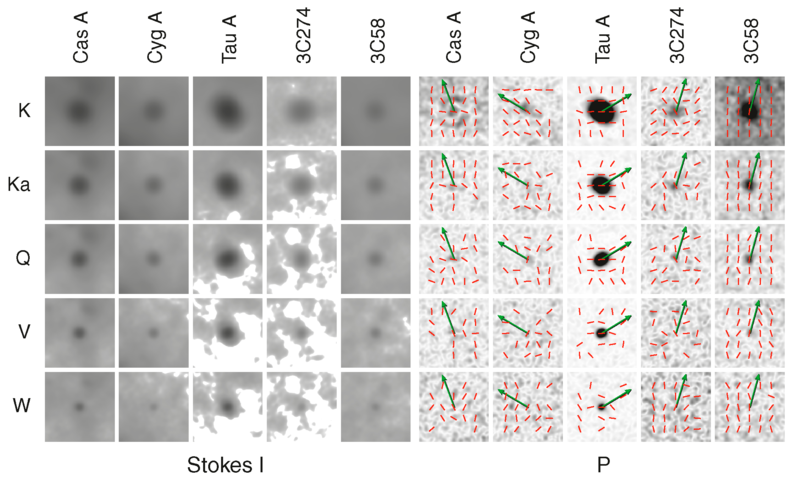 Filled blue circles are interferometric observations from Grossman et al. (1989), de Pater & Dickel (1991) and Dunn et al. (2005). Red circles are disk temperatures derived from WMAP data using an empirical model to separate disk and ring contributions. WMAP disk temperatures are corrected to absolute brightness. The WMAP values agree with the interferometric observations within the uncertainties, while providing tighter constraints at multiple frequencies. Uncertainties in the WMAP-derived disk temperatures are expected to decrease when observations at ring inclinations near 0° become available. Ammonia absorption near 24 GHz is less pronounced for Saturn than for Jupiter, making tighter constraints useful. 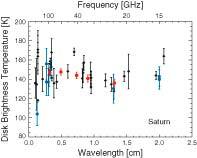 Brightness temperature of Saturn’s combined rings. 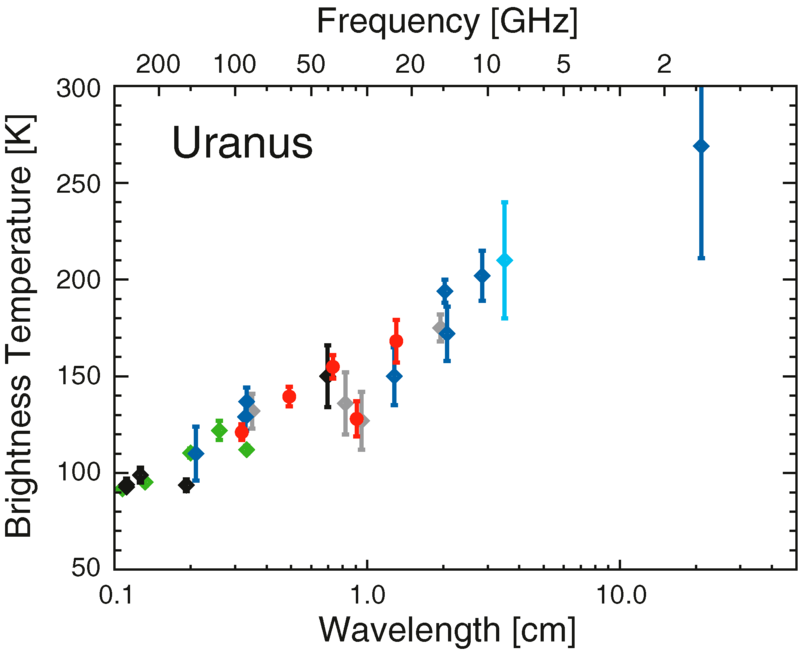 Interferometric measurements taken from Table 4 of Dunn et al. (2005) are shown in green. Black points are older observations from Janssen & Olsen (1978) and Schloerb et al. (1980). Model predictions from Figure 7 of Dunn et al. (2005) are plotted as the blue line. The derived WMAP ring temperatures, shown in red, compare well with the observations of others and the Dunn et al. model. Results from Dunn et al. (2002) indicate that the rings primarily scatter rather than absorb CMB radiation; thus ring temperatures have not been corrected to absolute brightness as is necessary for the disk temperatures. Contribution of ring emission plus ring-attenuated disk emission to the total computed brightness temperature of Saturn, expressed as a percentage. Exact values are model dependent; this set is for the empirical model discussed in the text, and whose parameters are given in Tables 10 and 11. The ring system contribution is lowest in K band, where thermal emission is dropping and scattering is more dominant. 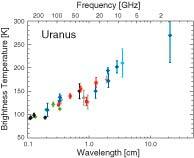 Microwave spectrum of Uranus, compiled from selected observations in the literature. Points have been color-coded into wide bins of observational epoch: gray for 1966-1969, blue for 1970-1979, green for 1980-1989, black for 1990-1999, red for WMAP points (2001-2008) and cyan for the 1966-2002 mean and peak-to-peak variability observed at 3.5 cm by Klein and Hofstadter (2006). See text for detailed data references. WMAP data have been corrected to absolute brightness. Of potential atmospheric modeling interest is the ‘dip’ near 30 GHz. 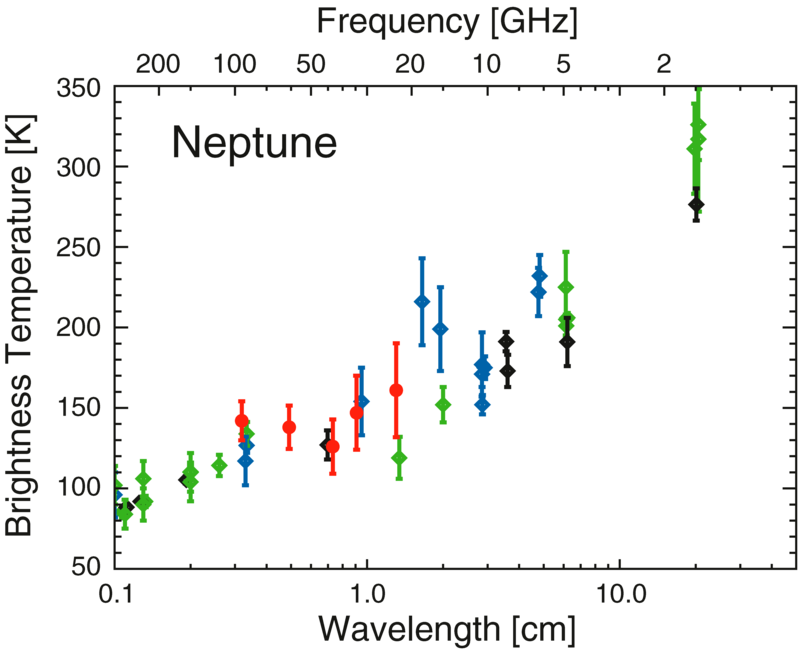 Microwave spectrum of Neptune, compiled from selected observations in the literature (see text). Points have been color-coded into wide bins of observational epoch: blue for 1969-1979, green for 1980-1989, black for 1990-1999, and red for WMAP points (2001-2008). WMAP data have been corrected to absolute brightness, and in general agree well with previously published values. Fractional yearly flux variation measured for the celestial calibrators over the WMAP mission. Parameters of the linear fits are listed in Table 16. The Spectrum of Cas A for epoch 2000. The red symbols show WMAP data. The black symbols show data from Hafez et al. (2008), Dunne et al. (2003) and Sibthorpe et al.(2010). The Archeops measurements of Desert et al. (2008), shown in blue, are suspected of being affected by dust emission not associated with Cas A. 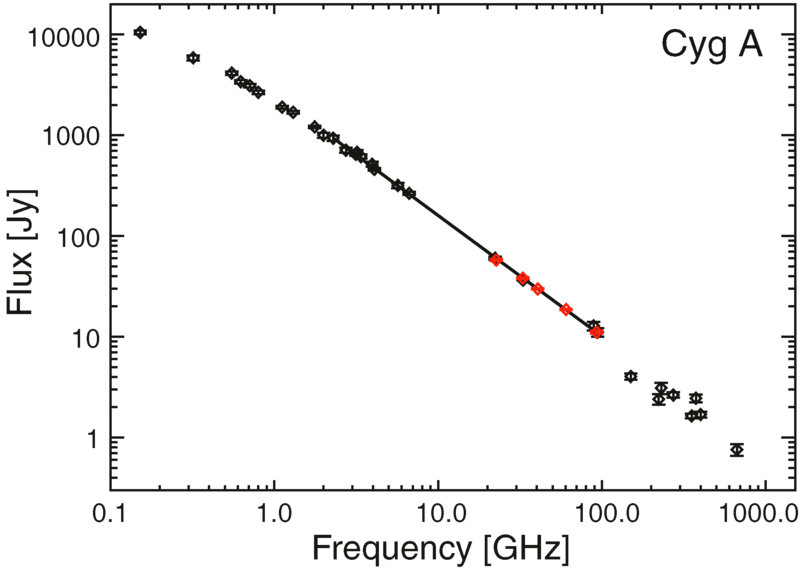 Black curve is a fit to the combined 1.4 - 250 GHz data of the form log S(Jy) = a + b log ν + c log2ν; coefficients are provided in Table 17. Spectrum of Cyg A. The red symbols show WMAP data. The black symbols show data from Baars et al. (1977), Wright & Birkinshaw (1984), Salter et al. (1989b), Eales et al. (1989), Wright & Sault (1993), Robson et al. (1998), and Hafez et al. (2008). 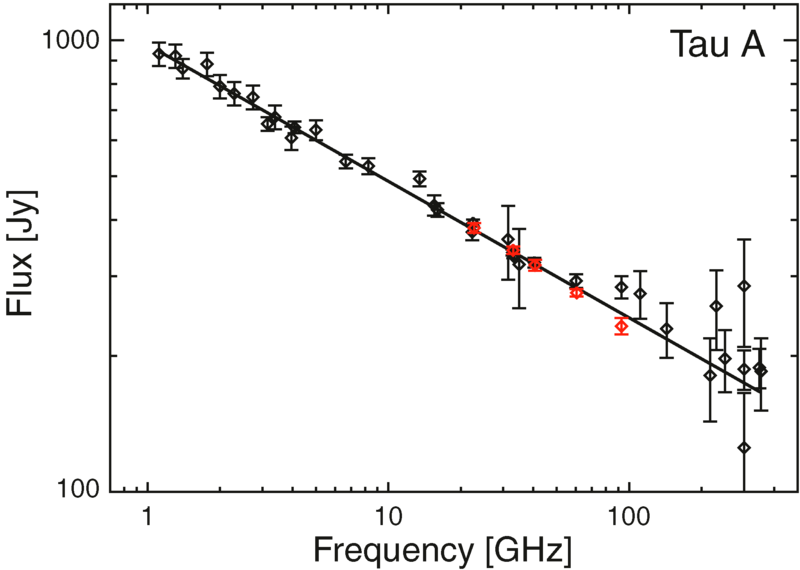 Black line is a power-law fit to the combined 2 - 94 GHz data; coefficients are provided in Table 17. Spectrum of Tau A for epoch 2005. The red symbols show WMAP data. The black symbols show data from Macias-Perez et al. (2010) and Hafez et al. (2008). 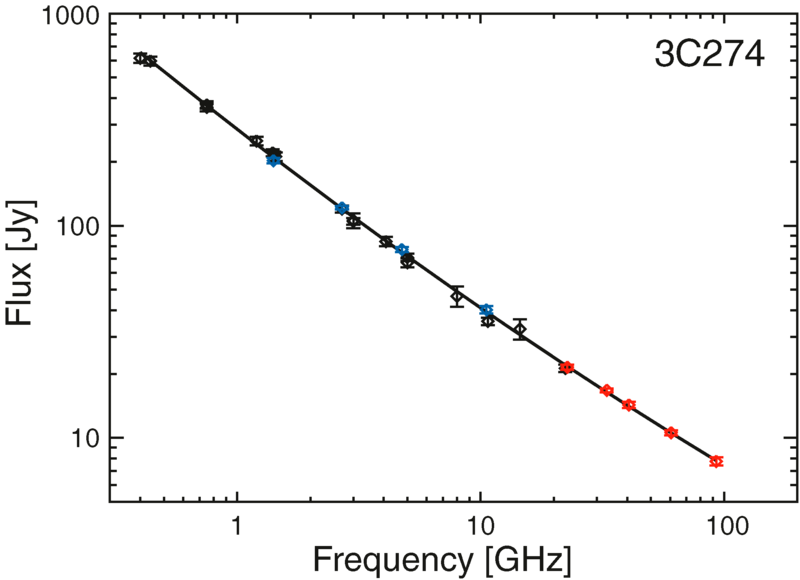 Black line is a power-law fit to the combined 1 - 353 GHz data; coefficients are provided in Table 17. Spectrum of 3C58. The red symbols show WMAP data. The black symbols show data from Green (1986); Salter et al. 1989a; Morsi & Reich 1987; Kothes et al. 2006; Hurley-Walker et al. 2009. 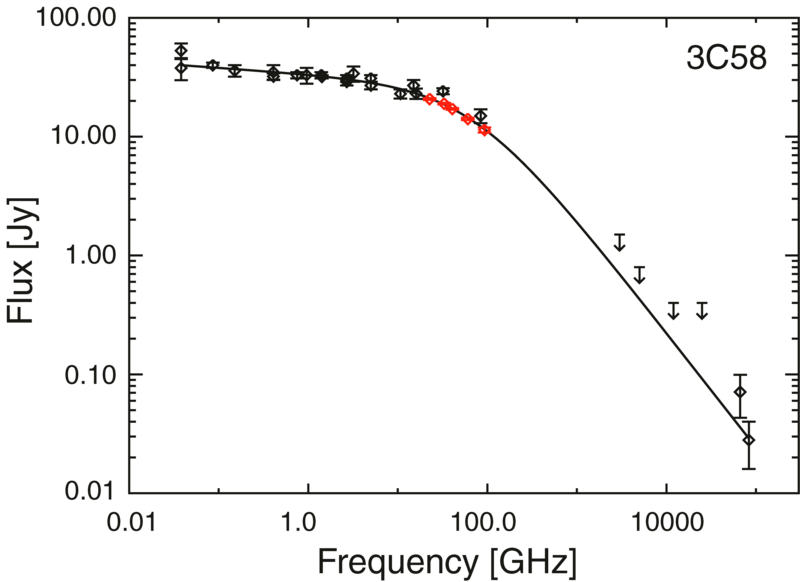 Black curve is a fit to the combined 0.04 - 83000 GHz data of the form log S(Jy) = a νb (1 + c νd) ; coefficients are provided in Table 17. Spectrum of 3C274. The red symbols show WMAP data. The black symbols show data from Baars et al. (1977) and blue symbols show data from Ott et al. (1994). Black curve is a fit to the combined 0.4 - 93 GHz data of the form log S(Jy) = a + b log ν + c log2ν; coefficients are provided in Table 17. Sky-fixed calibration sources in temperature and in polarization. Each picture is 4°.15 in a side, and the vertical direction is aligned with Galactic north. Sources are labeled along the top, and frequency bands are labeled along the left side. Bright pixels are displayed as black. Left : Stokes I logarithmically scaled; peak pixel values in K band are 60.8, 19.3, 95.8, 5.4, and 7.2 mK thermodynamic, respectively, for the five sources, at a native resolution of HEALPix nside = 512. 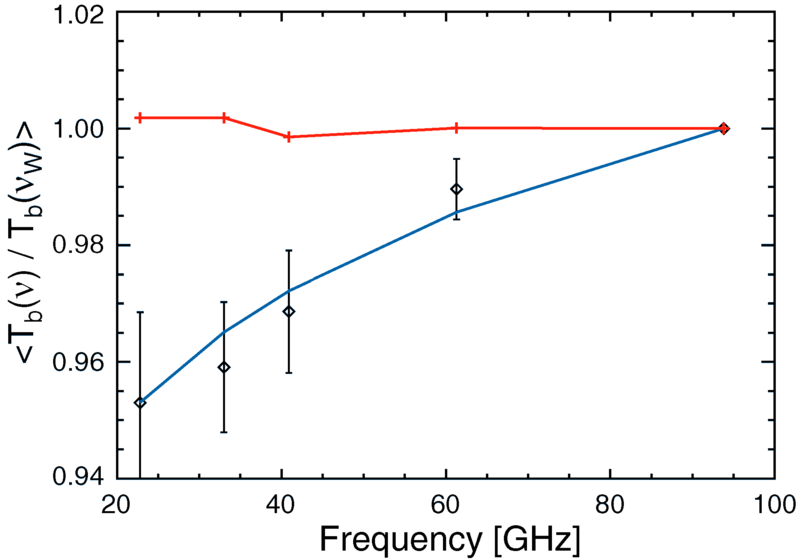 Right: polarization P = (Q2 + U2)0.5, where Q and U are Stokes parameters, smoothed with a Gaussian of FWHM = 13'.5. 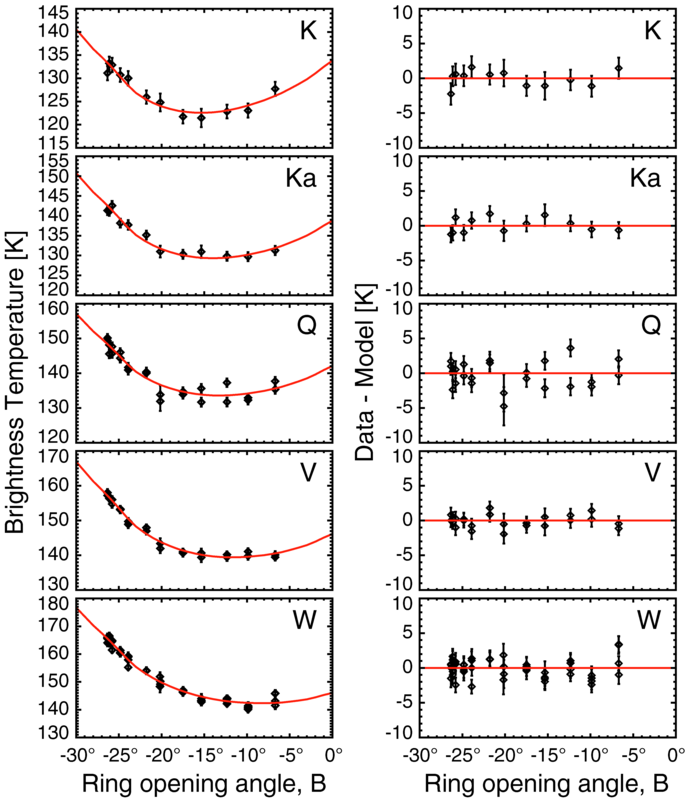 Scaling is linear between 0 and 0.25 mK thermodynamic, except for Tau A, where scaling is linear between 0 and 1 mK thermodynamic. Green arrow: north in the equatorial coordinate system. Red bars: polarization direction in a square pixel 39' wide, shown only where the S/N of P is greater than ~ 2. 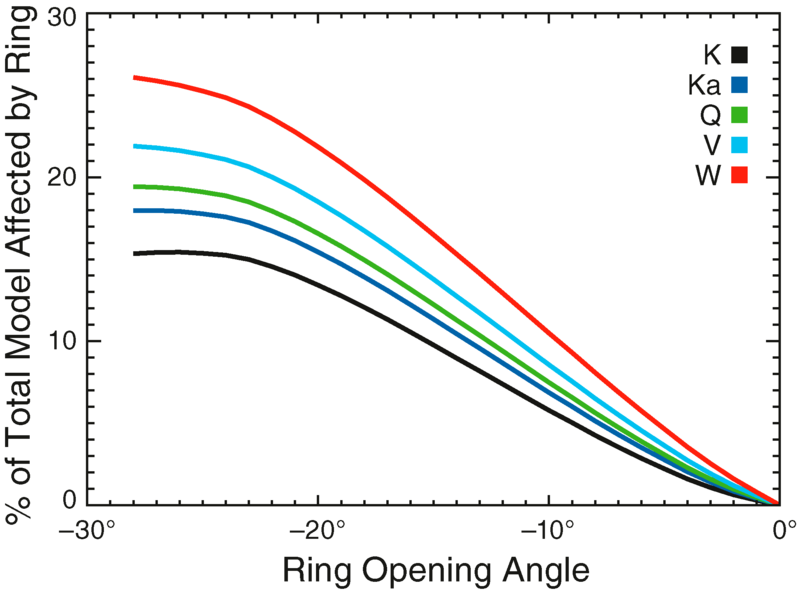 The broken ring around Cas A in K band is spurious and results from beam ellipticity coupled with effective frequency differences between the two orthogonally polarized K-band radiometers. Simplistic simulation of a false polarization signal which would resemble a ring encircling Cas A at a radius of ~ 50'. 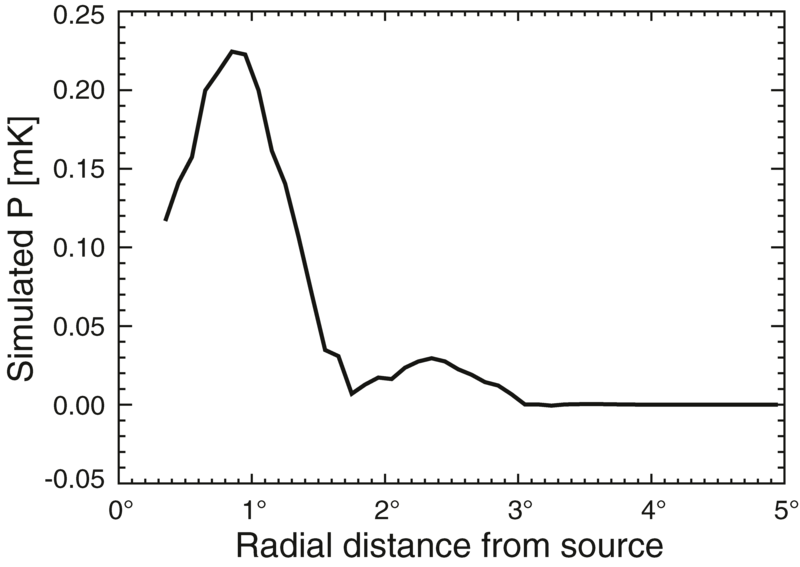 The black line is the radial profile of an azimuthally symmetric polarization artifact centered on the source, resulting from a combination of beam, detector and source properties. The simulation approximately reproduces the observed ring structure surrounding Cas A in Figure 19, but is brighter by ~ 35%, and does not include details such as the asymmetric scan-angle distribution in the data. Position angle of integrated polarization of Tau A in equatorial coordinates as a function of wavelength squared. 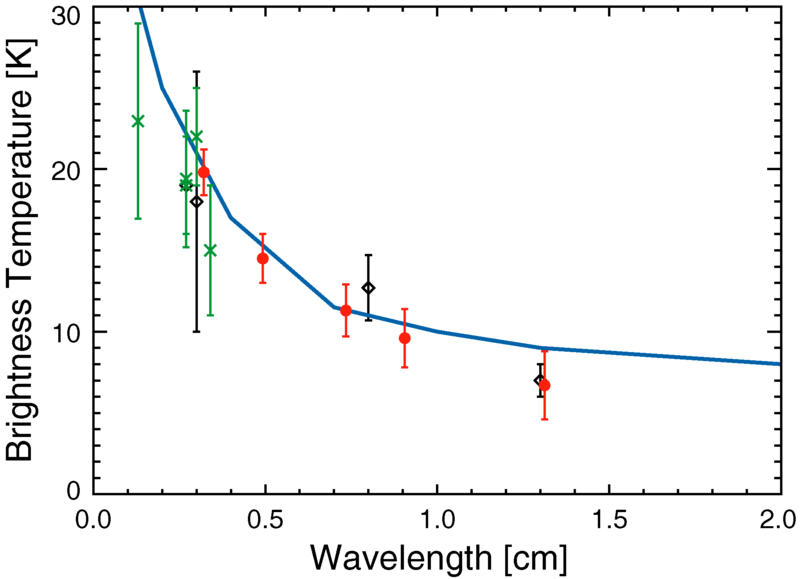 The WMAP results from Table 15 are shown in red, with error bars that include a systematic uncertainty of 1.5°. Results shown in black are from references in Wilson (1972) and from Aumont et al. (2010) at 90 GHz for a 10 arcmin beam. The linear fit gives an intrinsic polarization position angle of 148.5° ± 0.3° and a rotation measure of -24.1 ± 0.2 rad m-2.